Issue #195 • August 25, 2014•Buy Now! I was in the kitchen watching The Weather Channel when the girl from two floors down knocked on my door and asked if I wanted to fall in love. I had seen her a few times before on the front stoop of the building, listening to her iPod through giant coconut headphones. You could tell she was proud of her shins by the way she stretched her legs from the stoop to the sidewalk, her black skirt bunched up at mid-thigh so you had no choice but to look. Sometimes she’d shout out random lyrics to whatever song she was listening to, singing in a high, off-key voice that reminded me of a bird that had once lived inside my air conditioner. I’d forget all about her and then wake up in the middle of the night with whatever song she’d been singing rattling in my head. Her musical choices seemed obscure but maybe they were big hits that had somehow eluded me. I’d start pacing the apartment trying to identify the song but I never could; I’d wind up staring at the ceiling until the alarm clock rang and then drag myself to work and sleep at my desk. It was annoying but except for the insomnia and the occasional daydream about her shins we were strangers until that night she knocked on my door. Chuck Augello lives in New Jersey with his wife, three cats, and several unnamed birds that inhabit the back yard. His work has appeared in Hobart, Juked, Word Riot, The Review Review, Smokelong Quarterly, and other journals. A graduate of the MFA Program at Queens University, he is an editor with the online journal Cease, Cows and publishes The Daily Vonnegut, a website exploring the work of Kurt Vonnegut. Hurricane Sandy happened almost two years ago, but its effects are still felt across New York City. I’ll never forget the way giant trees were thrown about like tinker toys, and the dread my neighbors and I felt as the Gowanus Canal broke its banks and started flooding sewage into the streets. As sections of the city were destroyed, and others left without power for days and even weeks, from Staten Island to Red Hook we were all shaken. Sandy was a reminder of how Mother Nature can bring civilization to its knees. 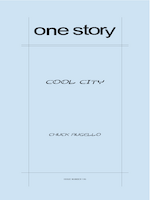 That kind of chaos and randomness can be a frightening thing, so when Chuck Augello’s “Cool City,” appeared in our slush pile, I found myself both surprised and charmed by the way Augello took those same feelings of fear and uncertainty and spun them into a story about connection and love. Set during a terrible, Sandy-like storm, "Cool City" follows two young city-dwellers, each trying to cope with the randomness and terror of life. One uses numbers and OCD-like behaviors to make himself feel safe, the other uses “Fast Love”—a unique self-help program where love is broken down to an impulse decision followed by immediate, binding commitment. Be sure to read Chuck Augello’s Q&A with us about how he came up with the concept for “Fast Love,” as well as his decision to use Rainer Maria Rilke’s poems in “Cool City.” I was moved and relieved when reading the final pages of this story, just as I was by the outpouring of volunteers and neighbors coming together in the aftermath of Sandy’s destruction. Like these two characters who fall in love during the chaos and wildness of the storm, when the rain finally stopped we found true comfort in each other. CA: The first sentence popped into my head one morning while I was walking my dog. I didn’t know anything about the characters or the story but I liked the sound of it and I let the sentence hang out in my head for a while. I don’t outline—I usually just stumble around in the dark for a while until a story takes shape. After a week I sat down and started writing, hoping the story would take off. I wrote about ten pages, most of which made it to the final draft, but I still wasn’t clear about the story’s direction and I stopped working on it for almost a year. CA: The ending—I struggle with endings. I wanted to show that Annabelle and Dash had a future together without being too obvious. When she knocked on the door with that camping stove I probably felt as relieved as Dash because I knew that it would drive the ending. HT: How did you come up with the idea for “Fast Love”? And did you know from the start that this would be a love story? CA: Yes, it was always intended as a love story. Initially I was thinking it might be flash fiction—a brief encounter that would begin and end with them talking outside his apartment door. But that approach didn’t last. I kept coming up with new ideas, and “Cool City” wound up as the longest story I’ve ever written. Regarding Fast Love, I needed some justification for Annabelle asking a stranger if he wanted to fall in love with her. My first thought was that Fast Love would be Annabelle’s original idea but then it seemed a bit too quirky and likely to scare Dash away. But if there was an actual movement—if he could check out a website and see other people sharing Annabelle’s belief in it—he’d be more open to considering the possibility that she was right. The first draft of this story was written while I was in the MFA program at Queens University. Before the workshop someone in my group said that after he read it he googled Fast Love to see if it was real. I took that as a good sign that readers might be able to buy into it. It’s an idea that makes sense to me. In relationships I think people do spend too much time looking for reasons not to love someone. Fast Love might be an extreme reaction to that but for some people I think it could work. I’m married so I won’t be trying it out myself but I like the idea. Perhaps I can dress up like Dr. Ashokan and try to get the movement started. HT: Your use of lists, pie charts and word translations in “Cool City” make for a fun and unique read. Is this something you often use in your work? CA: While writing “Cool City” I was also working on a novel with a first person narrator. Sometimes I felt the need to break out of the first person voice so I started including interviews with other characters, some graphs, charts, and a lot of song lyrics, some well-known, some obscure, and some that I made up myself. For “Cool City”, I needed a way for them to share a lot of information quickly, and I thought the chart was more effective than dialogue. HT: Can you talk a bit about Dash’s relationship with his brother, Jerry? Why did you decide to include him, and also why put Jerry in the military? CA: I wanted Dash to have someone he could confide in but knew that his loneliness was a key part of the story. So I gave him a brother but sent the brother away so that the relationship wouldn’t be a close one. Having Jerry be in the military provided a reason for him to have left home at an early age and for his continued role as an important but distant presence in Dash’s life. HT: Why did you decide to use Rilke poems in this story? CA: For a while I was working on a collection of linked stories with the title The Archaic Torso of Love, in which all of the characters stumble upon a Rilke poem and proceed to change their life. The first story I wrote for it, “Languid’, appeared earlier this year in Jelly Bucket, a journal published by the Bluegrass Writers Studio at Eastern Kentucky University. I began “Cool City” a few weeks after I finished “Languid” so that idea was still an influence during the initial draft. It’s kind of strange because I don’t consider myself a big Rilke fan but when I read through a collection of his work I found many individual lines that seemed to fit well with the type of stories I was writing. Annabelle would have changed her life anyway even if that book of poems hadn’t been at Starbucks that morning but sometimes we need a little outside inspiration and I thought the poem was something that would resonate with her. Once she introduced it to Dash’s life I knew that he would delve into it and find more of Rilke’s work, and that it would be a safe way for him to bring himself closer to her world. It was during the editing process with Hannah that the idea of using the original German was introduced. It was Hannah’s suggestion, and I was grateful for it. I don’t know any German but it was great fun comparing the lines in German and English, and then seeing how the translator (Stephen Mitchell in the edition of The Selected Poetry that I used) presented the work in English so that it was actual poetry instead of the concrete word by word translation you could find on various websites. It’s all the proof anyone might need for the value of translators—I doubt that translation software will ever be able to capture the grace and nuance of language the way a talented translator can. HT: Dash’s OCD/compulsions seem to be about trying to exert control/order over a world that is decidedly out of control (especially with the raging hurricane Denise). Do you think Annabelle is trying to do the same, with Fast Love? Control the uncontrollable? CA: Yes—absolutely. It’s a reaction to the crisis of her life and the sense, which I think many people share, that the world is slipping out of control. One way to combat that feeling is to adopt a steady, almost blind faith in a specific philosophy. Many people choose religion. Annabelle chooses Fast Love. CA: I wrote the first few pages in a week and then put the story away for about a year. When I returned to it I finished the first draft in about a month. Over the next several months I revisited it every so often, making minor tweaks along the way. The version I submitted to One Story was completed in January 2014, about eight months after I finished the initial draft. I worked with Hannah on the revisions over a period of about a month. It was a great learning experience. CA: I’m finishing a story collection, which is almost completed. I’m also working on two novels. One is titled The Revolving Heart. It’s about lost love, a missing child, narcolepsy, and the human propensity for repeating our biggest mistakes. The other novel doesn’t have a title yet—it’s set in Cool City and follows a couple who meet and fall in love over a three day weekend while parts of the city are literally disappearing. My other project is The Daily Vonnegut, a website for fans of Kurt Vonnegut. We have interviews, links pages, and plenty of Vonnegut trivia. It’s just getting started but it’s plenty of fun. CA: During my time in the MFA Program at Queens the writer David Payne commented that my biggest strengths were my biggest weaknesses. I have a propensity for coming up with quirky ideas and crafting amusing and clever scenes but that doesn’t always work, and my reliance on a gag or a funny line of dialogue can make the work feel shallow. Sometimes I’ll sacrifice character or story going for a laugh. David was pushing me to give the work the proper respect and not settle for what is easiest for me. It’s a useful reminder that I keep in the back of my head. The other advice is a line from Kurt Vonnegut: Use the time of a total stranger in such a way that he or she will not feel the time was wasted. There’s nothing more important than entertaining the reader.